The Regulator-Moderator War in East Texas. If we can sort this out, it goes something like this: a feud that grew into a war erupted in East Texas in 1839 and raged until 1844, with occasional flair ups at various times for years afterwards. One side was called the Regulators, who, as their name implies, wanted to "regulate" the activities of rivals. Naturally, the Moderators wanted to "moderate" being "regulated." Now it gets confusing. Trouble brewed between rival groups who had settled along the border between Louisiana and Texas earlier in the century when neither the United States or Spain made much effort to control the area. Many were rough and ready fellows accustomed to settling disputes with firearms. In the beginning the cast of characters included Regulator leaders Charles W. Jackson and Charles W. Moorman, Moderator leaders Edward Merchant, John M. Bradley and Deputy Sheriff James J. Cravens, with President Sam Houston in a minor role. Land swindling, cattle rustling, and various other affronts provided the fuel and the spark for the war. Jackson shot a man named Joseph Goodbread in Shelbyville. That led to the first of many armed confrontations between the sides at Jackson's trial. Jackson was later killed from ambush and the war was on. Deaths on one side or the other always required avenging and the fighting continued, sometimes reaching the level of actual battles. President Houston, who was familiar with the area and its residents, at first said that the only thing to do was let the Regulators and Moderators fight it out. Obviously that policy was unacceptable. 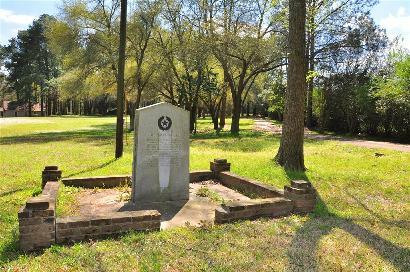 In 1844 Houston sent Travis G. Brooks and Alexander Horton with militia to end the fighting. 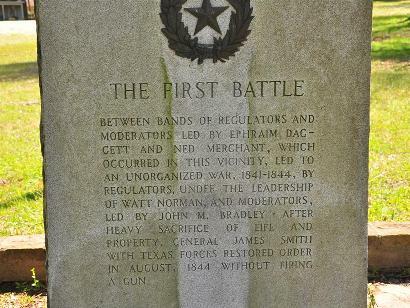 They arrested ten men from both sides, but only a truce negotiated by Judge William B. Ochiltree, Isaac Van Zandt, and David S. Kaufman convinced the sides to quit fighting, at least temporarily. Ironically, within two years some Regulators and Moderators fought side by side against Mexican troops in the war against Mexico. But did the Regulator-Moderator War really end? Bad blood between individuals continued in subsequent generations. Even some twentieth-century disputes owed their origin to animosities established long before the antagonists were born.